Last week I made a little lunchtime experiment. 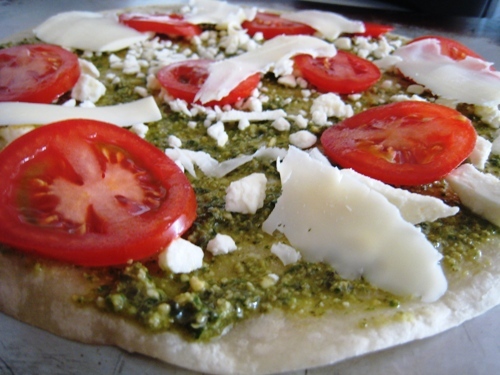 I took my regular feta-pesto pizza toppings and placed them on a tortilla. I was feeling lazy and hungry. See? I didn’t even grate the mozzarella. Just shaved off some thin slices. Then I ran it under the broiler for three minutes. It was delicious! Next time I’m going to toast the underside somehow first and then put on the toppings to ensure a crisper crust. This was a decadent lunch after all my laziness. The flavors of the feta and pesto carried a great punch. Two thumbs up! You could put whatever topping you want on top. Experiment and let me know how it goes for you! That looks amazing! Thanks for hosting! I shared my crispy pan seared flounder recipe. You can use any flat fish. It uses potato flakes as the breading. I love making tortilla pizzas! I do mine on the stove top. Toast the first side for a few minutes, then flip and throw the ingredient on and if your bottom is toasted by the time you get done, turn it off and put the cover on to melt the cheese. It’s delicious!! Thanks! Nothing too exciting on my plate. Just a loaded baked potato (a wee bit of butter, salt & pepper, cheese & sour cream.) It was yummy! Mmm, that looks delicious. I adore Pesto and I should use it more often. What a great idea to use tortillas…certainly makes it doable for a busy weekend night! I always seem to have whole wheat tortillas in the fridge too! Thanks for hosting and the great idea. That looks like a wonderful pizza idea! That looks so good! I included my very favorite coffeecake recipe. Yum! I do something simular except I throw another tortilla on top and make what I call a pizza quesadilla.